Sixth form students are being warned not to cheat on their university application forms by copying material from the internet. The Universities and Colleges Admissions Service has written to every UK school saying doing so could affect students' chances of winning a place. 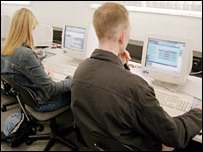 Ucas is to use plagiarism detection technology to scrutinise the half a million forms seeking entry in 2008. A study suggested one in 20 applicants cheated on their personal statements. The statement is the part of the form where would-be students write about themselves and their interests in their chosen courses of study. A personal statement should be the student's own work. It gives them the chance distinguish themselves from other students with similar qualifications. Ucas head of technology and strategy Steve Harrop said: "A personal statement should be the student's own work. If three sentences or more - 10% of the statement - appear to have been copied, the form will be passed to Ucas staff for further scrutiny. They might then pass the case on to the individual institutions to which a student has applied for a decision on further action. Ucas said checks on 50,000 forms earlier this year found that approximately 5% of applications had "some element of plagiarism". This ranged from a very low level through to candidates who had copied and pasted the whole thing. Mostly students appeared to use material from websites offering advice on how to apply. Analysis for Ucas showed some 800 would-be medical students had lifted chunks of text from the same website. And 234 included the same anecdote saying their interest in chemistry had begun when they had burnt a hole in their pyjamas. As the deadline for applications got closer the number of those using borrowed material had increased, the study found. When the results of this research was received, Ucas said it would be looking at how it could screen applications for similar borrowed material.